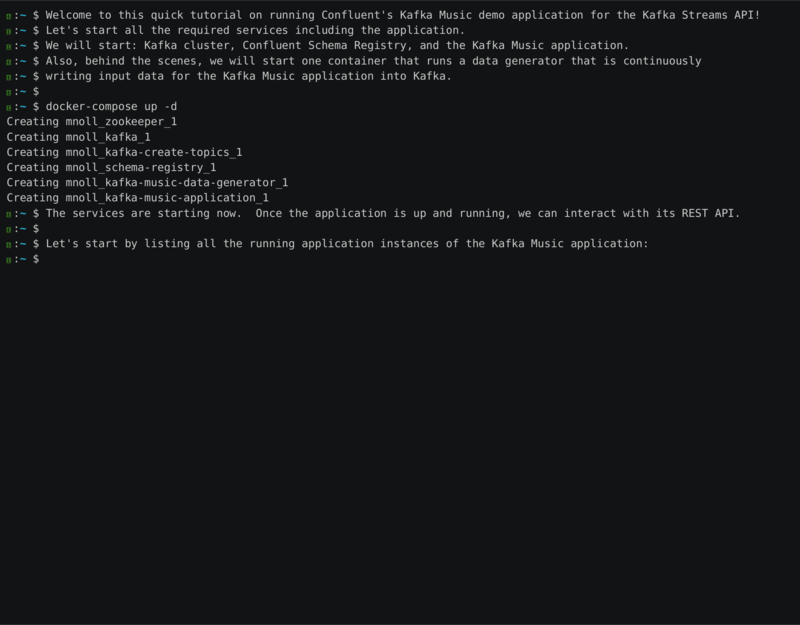 In this tutorial we will run Confluent’s Kafka Music demo application for the Kafka Streams API. The Kafka Music application demonstrates how to build of a simple music charts application that continuously computes, in real-time, the latest charts such as Top 5 songs per music genre. It exposes its latest processing results – the latest charts – via Kafka’s Interactive Queries feature and a REST API. The application’s input data is in Avro format and comes from two sources: a stream of play events (think: “song X was played”) and a stream of song metadata (“song X was written by artist Y”); see inspecting the input data in the Appendix for how the input data looks like.